UP Pullman Plan #3973A 10 section-1 drawing room-1 compartment (10S-1DR-1C) sleeper COLUMBIA GORGE. 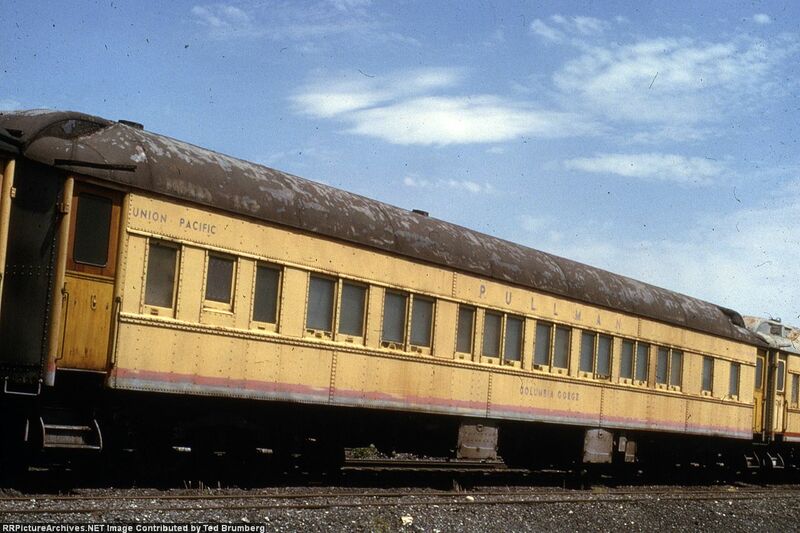 Built by Pullman in May 1930 in Lot #6358 for San Francisco-Spokane service, sold to UP at the 12/31/1948 divestiture and leased to Pullman for operation, repainted in May 1952 from Pullman Green to Armour Yellow, withheld from lease in July 1962, transferred to the roadway (MofW) department in 1964 as bunk car #906031, retired in 1973, no further disposition info. Scanned with an Epson V550 from a duplicate Ektachrome 35mm slide.